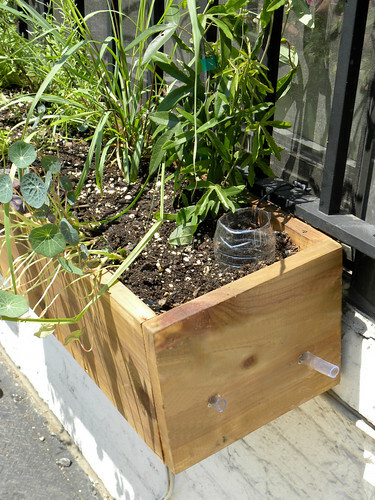 If you are new to the concept of portable micro gardens using sub-irrigated planters (SIPs) it is helpful to see what others have done. Note that the planters are in a backgard on top of gravel. They could be on concrete in any city in the USA. Lisa-Marie is blogging about the progress of her EarthBox SIP garden. She comments about both the successes and minor setbacks she has encountered. Take a look. While it's good to see this workshop on the subject of soil contamination why aren't their frequent workshops like this here in New York City? The Cornell extension program now has very limited presence in the city and the botanic gardens are mute on this important subject. Urban soil contamination is much more widespread than the public realizes. The best advice is to test city soil for toxic metals contamination before growing edible plants. Better yet is to grow in sub-irrigated portable micro gardens, the safest, most hygienic and productive way to grow food in the city. They're "farming concrete" here in Jersey City. When growing in sub-irrigated portable micro gardens like these EarthBoxes, this lot could just as well be blacktop or concrete. This isn't about farmer wanabee hipsters and yuppies, it's about growing fresh food and fresh new outlooks for people living in very difficult environments. Where is the leadership to make this happen in all concrete jungle neighborhoods across America? This blogger chronicled the amazing growth of two tomato plants with a number of photos starting on May 23, 2011. See the day 2 photo after the jump. 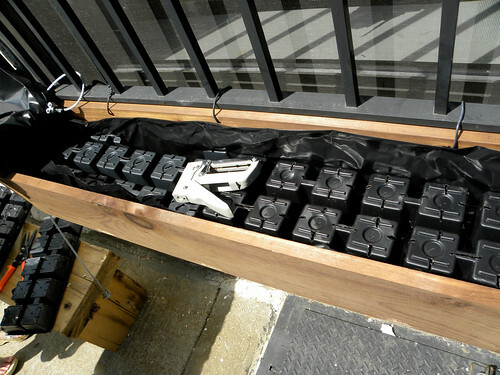 Note that the sub-irrigated portable micro garden (an EarthBox in this case) is sitting on concrete. It could just as well be on concrete in any city in America. All it takes to do this is sunlight and significantly more enlightened education than we currently have. This update is a day late and I was also late in watering this very hot week here in Brooklyn. You can see two symptoms. One there are some wilted leaves that could not recover from desiccation; two the greens are bolting or flowering/turning to seed. The first symptom is avoidable the second is not. These greens are not a hot weather crop. I will probably plant a new crop to grow a fall salad bar. There is still fresh food here however.